By Siddharth Dhomkar, City College of New York and Jacob Henshaw, City College of New York. With the amount of data storage required for our daily lives growing and growing, and currently available technology being almost saturated, we’re in desparate need of a new method of data storage. The standard magnetic hard disk drive (HDD) – like what’s probably in your laptop computer – has reached its limit, holding a maximum of a few terabytes. Standard optical disk technologies, like compact disc (CD), digital video disc (DVD) and Blu-ray disc, are restricted by their two-dimensional nature – they just store data in one plane – and also by a physical law called the diffraction limit, based on the wavelength of light, that constrains our ability to focus light to a very small volume. One approach to improving data storage has been to continue in the direction of optical memory, but extend it to multiple dimensions. Instead of writing the data to a surface, write it to a volume; make your bits three-dimensional. The data are still limited by the physical inability to focus light to a very small space, but you now have access to an additional dimension in which to store the data. 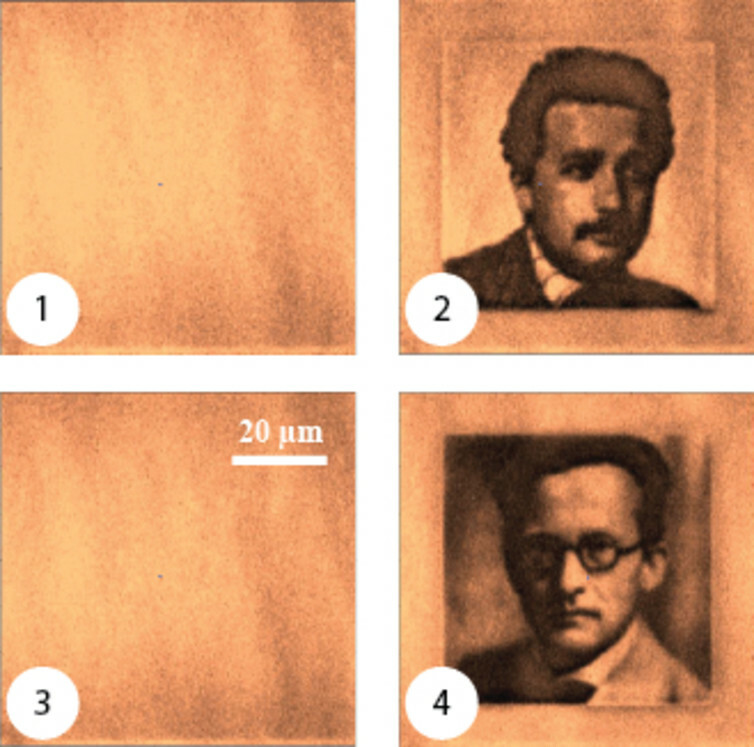 Some methods also polarize the light, giving you even more dimensions for data storage. However, most of these methods are not rewritable. A diamond is supposed to be a pure well-ordered array of carbon atoms. Under an electron microscope it usually looks like a neatly arranged three-dimensional lattice. But occasionally there is a break in the order and a carbon atom is missing. This is what is known as a vacancy. Even further tainting the diamond, sometimes a nitrogen atom will take the place of a carbon atom. 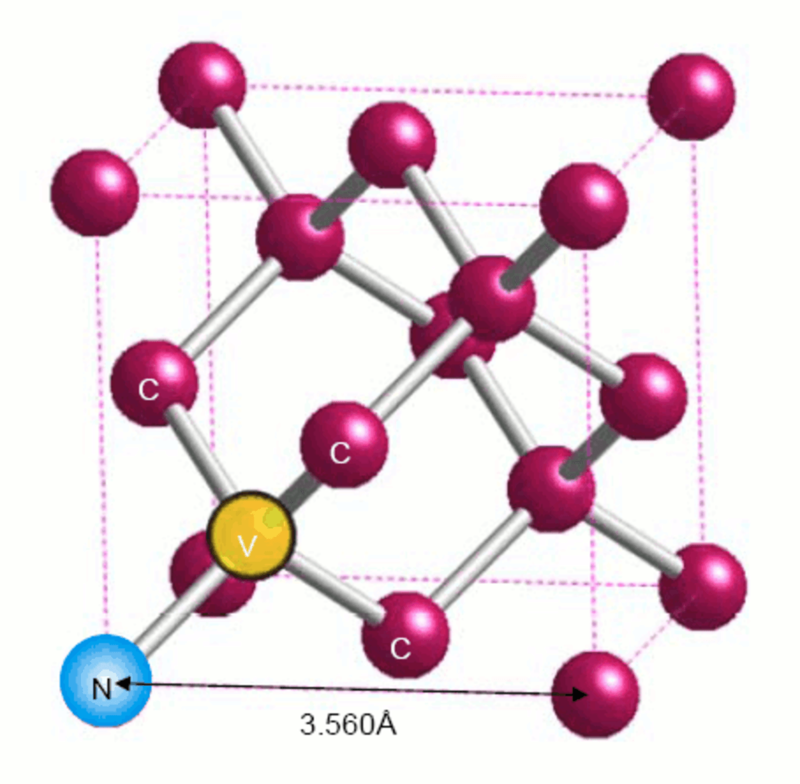 When a vacancy and a nitrogen atom are next to each other, the composite defect is called a nitrogen vacancy, or NV, center. These types of defects are always present to some degree, even in natural diamonds. In large concentrations, NV centers can impart a characteristic red color to the diamond that contains them. Starting from a blank ensemble of NV centers in a diamond (1), information can be written (2), erased (3), and rewritten (4). The NV centers can encode data on various levels. Our method is still diffraction limited, but is 3-D in the sense that we can charge and discharge the defects at any point inside of the diamond. We also present a sort of fourth dimension. Since the defects are so small and our laser is diffraction limited, we are technically charging and discharging many defects in a single pulse. By varying the duration of the laser pulse in a single region we can control the number of charged NV centers and consequently encode multiple bits of information. 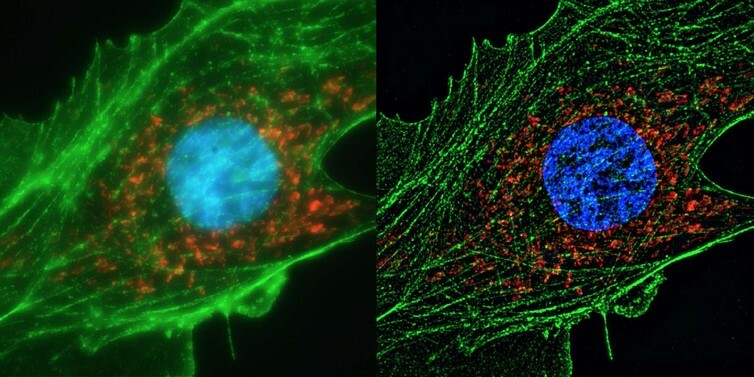 A human cell, imaged on the right with super-resolution microscope. 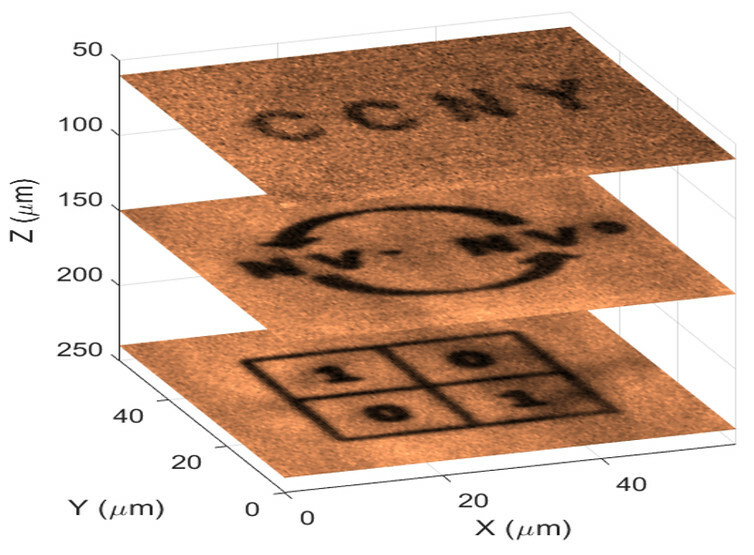 Nitrogen vacancy centers have also been used in the execution of what is called super-resolution microscopy to image things that are much smaller than the wavelength of light. However, since the super-resolution technique works on the same principles of charging and discharging the defect, it will cause unintentional alteration in the pattern that one wants to encode. Therefore, we won’t be able to use it as it is for memory storage application and we’d need to back up the already written data somehow during a read or write step. With these advanced protocols, the storage capacity of a diamond would surpass what existing technologies can achieve. This is just a beginning, but these initial results provide us a potential way of storing huge amount of data in a brand new way. We’re looking forward to transform this beautiful quirk of physics into a vastly useful technology.